MAY 22, 2013 -- The threat of oil spills from historic shipwrecks only occasionally comes to the public's attention. A few notable examples include the S/S Edmund Fitzgerald in the Great Lakes and the S/S Montebello off southern California. But we know that these wrecks are just the tip of a much larger iceberg. The past century of commerce and warfare has dotted U.S. waters with shipwrecks, many of which have never been surveyed. Since 2010, NOAA's Office of Response and Restoration and Office of National Marine Sanctuaries, working with the U.S. Coast Guard, have been systematically looking at which of these wrecks might pose a substantial threat of leaking oil still on board. This work is part of NOAA's Remediation of Underwater Legacy Environmental Threats (RULET) project. We used a tiered approach to develop an initial priority list of vessels for risk assessment. This process narrowed down the estimated 20,000 vessels in U.S. waters to 573 that met the initial criteria. The ships had to be over 1,000 gross tons (making them about 200 feet or longer), built to carry or use oil as fuel, and made of a durable material such as steel. 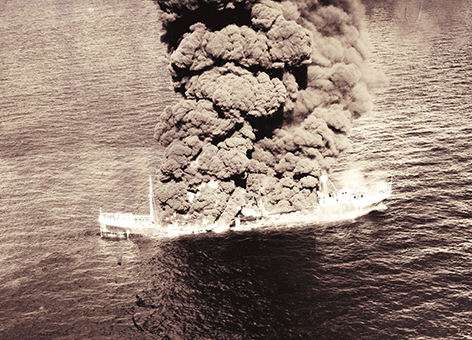 Additional research revealed the actual number posing a substantial pollution threat was lower because of the violent nature in which some ships sank (many were lost in World War II). This is because, for example, a ship hit and sunk by torpedoes would be less likely to still have intact tanks of oil. And other vessels were taken off our radar because they have fallen apart or were demolished because they were navigational hazards. We also used computer models to predict the environmental and economic consequences of oil spills from these vessels. Those results then helped us sort out which wrecks might pose the biggest risks. On May 20, we released both an overall report describing this work and our recommendations and 87 individual wreck assessments. The individual risk assessments highlight not only concerns about potential ecological and socio-economic impacts, but they also characterize most of the vessels as being historically significant. In addition, many of them are grave sites, both civilian and military. 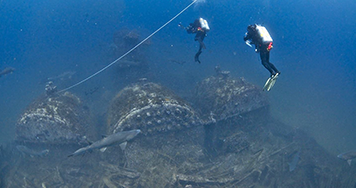 The national report and the 87 risk assessments are available at https://sanctuaries.noaa.gov/protect/ppw/.